All manufacturers face challenges. Some of the most common being bottlenecks or limitations to their processes which force higher costs than necessary,thus limiting their markets potential. These challenges can be made even more acute when spread over different vendors or situations where one limitation might cause a cascading effect with other vendors, creating even more challenges that can be potentially catastrophic. While identifying these limitations are essential, the question arises how to resolve them effectively thus maximizing the benefits of both the opportunity and resolution. One company found a way to do just that. A specialized manufacturer was engaging in an expansion from the their current successful niche market to a more consumer oriented market, when analysis discovered a serious limitation that would have adverse effects on not only the expansion but any successful penetration in the consumer arena. Specifically the limitation, in this situation of a manufacturing bottleneck, was a critical part that required excessive production times thereby increasing the manufacturing costs that would inhibit consumer adoption. In addition, having to transport the part from one location to another under the control of a vendor, this created long term delays that would have further deteriorated the potential market expansion. These circumstances forced the company to seek a solution to the limitation and create an opportunity with Accurate Forming that would enhance their expansion instead of just dealing with the issues at hand. By considering a deep drawing manufacturer for a potential solution, they worked with Accurate Forming to engineer a solution that would not only resolve the bottleneck, but in turn also reduce the inhibiting cost factor while reducing transit times and improve overall quality of both the individual part and the end product. By working with the engineers at Accurate Forming, it was clear that the deep drawing process created a beneficial opportunity for the company. The ultimate result of which was the ability to reduce per unit costs by fifty percent and improve both transit and delivery times. Thus enabling a proper and successful expansion into the consumer market. 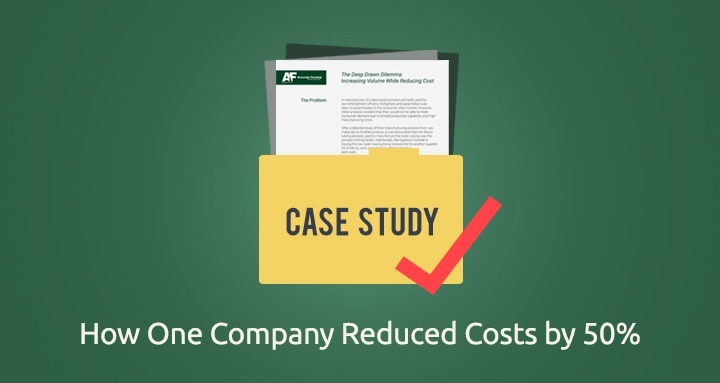 What can be derived from this case study or situation is that by seeking to alter a challenge into an opportunity, your company has the potential to improve not only the bottom line but a whole lot more with Accurate Forming's deep drawn process. By working with our engineers, the end result can prove to be more successful than other manufacturing processes. For a more detailed description and to learn how it was done, download the case study and see the benefits of deep drawing for yourself.